King salmon range from central California to northern Alaska and are the largest of the Pacific salmon, most commonly caught weighing between 11 and 18 lbs. They get much larger, however, and 18 to 25 lb fish are not at all uncommon, while the largest on record is a staggering 126 lbs! Kings have the highest fat content of them all, which gives their reddish-orange meat a deliciously rich flavor and texture. Unfortunately they are also the least abundant and most expensive as well. Like all Pacific salmon, Kings are born and die in fresh water. They are born in streams far inland from the ocean and spend about a year travelling downstream, often covering hundreds of miles. They spend the next four or five years in the open ocean, feeding on crustaceans and other fish. When the time comes for the long migration back to their spawning grounds, they stop eating altogether and live off their thick reserves of fat. Their skin starts to change color once they reach fresh water, although initially at least this does not have a significant impact on their meat condition. As they head further upriver and get closer to their spawning grounds however, their flesh starts to deteriorate. 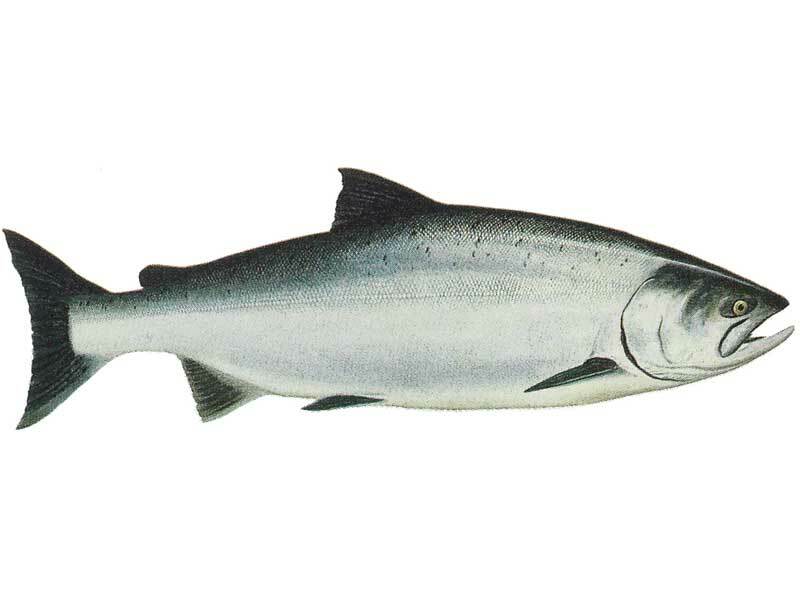 King salmon, like all Pacific salmon, only spawn once before they die in the stream of their birth. Kings are frequently marketed by the name of the river they come from, much as oysters and wines are named. Copper River, Taku River, Yukon River, and Columbia River are some notable examples, but there are many more. Fish caught in or near their river of origin tend to be caught by nets and sold head off, as the nets scar their heads. Trolling remains the harvest method of choice for offshore fish however, and they usually arrive with heads on, looking so bright and undamaged that it is not hard to imagine them swimming in the deep north Pacific looking for food.